Don't have any regrets after your big day - read these top tips from brides who have been there and done it, so you can learn from their mistakes. Check out Hayley's new blog which is all about All inclusive Wedding Packages! Video Blog: Its All About The Dress! 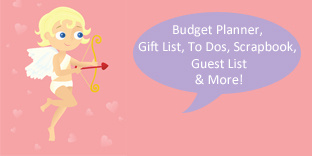 LoveWeddings TV - Tune in to Start Planning! Amazing wedding tip from a road manager who has seen it all…. Choosing what to wear to a wedding when you're a guest is never particularly easy, but it's even harder once the summer months are over. That's why we've put together some great tips on what to turn up in at autumn weddings. Do Selfie Sticks Have a Place at Weddings? It's usual for guests to bring their cameras and take photos at weddings, but with the rise in popularity of selfie sticks, it wouldn't be a surprise if these began making an appearance at these special occasions too. But what is the social etiquette of picture taking when it comes to weddings - and does wielding a selfie stick around such a formal affair breach it? It's not easy being the mother of the bride - not only do you have to be the emotional support for your daughter in the lead-up to the wedding, but you also have your own things to think about, including your outfit. You might be a huge music festival fan, love camping, or just really adore the idea of tying the knot in the countryside with nature on your doorstep. Whatever your reason for wanting a festival chic wedding, we're here to help. Battle of The Bands - Our Hot Favourites! How I Saved €10,570 on My Wedding! Don’t Order Your Cake Until You Read This! Getting married in the winter doesn't just mean you need to think carefully about what wedding dress you choose and which shoes to wear. You also need to give consideration to your make-up so you can emphasise your wintry look without looking like a snow queen. Ashlee Simpson and husband Evan Ross have waited nearly an entire year to show the public some snaps of their beautiful wedding - but the wait has been worth it. Italian heiress Beatrice Borromeo opted for a stunning blush pink wedding gown when she tied the knot with Prince Pierre Casiraghi this weekend. Nicky Hilton tied the knot with fiancé James Rothschild in Kensington Palace on Friday (July 10th). The Gift List Debate: To Have One or Not? The wedding gift list - the one time in your life you can really ask for what you want and fill your house with belongings that mean something to you. Or maybe not. Growing controversy concerning gift lists means many brides and grooms opt against them these days. When deciding how to wear your hair on the big day, there are a few things to consider. Go with something that isn't a million miles away from your usual style...you want the groom to recognise you walking down the aisle after all!